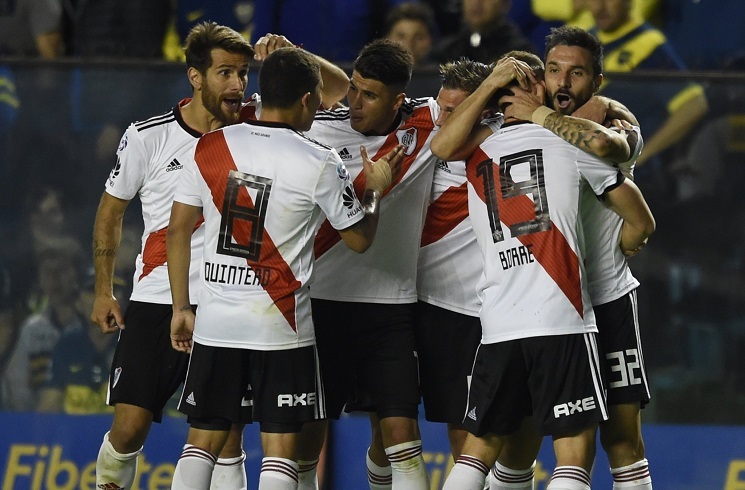 In a match which produced two incredible goals, six yellow cards and a great save by Argentina goalkeeper Franco ARMANI saw River Plate win 2-0 against Boca Juniors. Argentina international Gonzalo MARTINEZ scored one of the goals of the season as he gave River Plate the 1-0 lead. 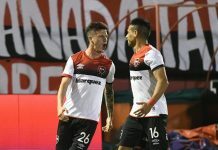 A volley goal beat Boca goalkeeper Agustin ROSSI. However, just minutes after scoring, MARTINEZ had to be substituted off due to an injury. In what probably should have been a sending off, Colombian Edwin CARDONA elbowed Enzo PEREZ in the face but was given a yellow card and not a red. The second half saw Boca come off on the strong foot with Dario BENEDETTO being at the end of a Cristian PAVON cross but BENDETTO’s effort went over the goal. Another moment of controversy in the match as River Plate’s Milton CASCO took Cristian PAVON down in the penalty area but the referee did not give the penalty kick. Lucas PRATTO was replaced up front by Ignacio SCOCCO and just five minutes after coming on, SCOCCO with an absolutely incredible strike double River Plate’s lead. Franco ARMANI’s goal was tested with the Argentina goalkeeper pulling off a great save to keep his clean sheet. 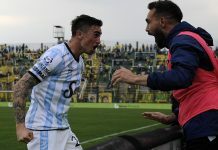 Bostero decime que se siente!!!! what a pleasure to do this inside their “home” . lo celso cannot play in high press game , he looses possession in dangerous area and doesnt know where to pass the ball. You can’t say that based on one bad game with Betis because Colombia was playing a pressing game and he handled him self very well. True, not his level. But I saw some good stuff between him and Canales. 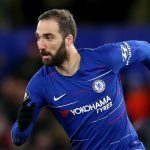 Hopefully he will improve with time. Normally should be fine, they play compact and possession football with technical players, should be compatible with Lo Celso style. He is new to the team. He should make some chemistry between them. Then it will be free flowing..for him. I am sure he will be a big hit there. Total dominance by Boca, river very lucky to win with two good goal, Boca dinied two penalties. By the way what about Centurion, I know he is a hot head. Where does he fit in?? Or will he. I don’t think any coach will risk in by taking him. Maybe on the left, in competition with Pity. But not my type of player, too much dribbling and not enough collective. So our Left side looks good now (After years of Di Maria demolishing opponents in the Left (Pun intended) now Pity (I usually thought he plays on the Right side like Messi or Dybala) looks likely to make that his spot with Competition from Cervi and Acuna. You have to earn the spot by continuously performing. To keep a player pushing forward there should be Competition which neither Di Maria, Higuain or Aguero had. Its a mistake from the Coaches side. For every position there should be a proven and tested back up. Gaitan or Perotti should have played lot more matches had they been given chances. Its ridiculous that Di Maria kept on to that spot for such a long time. Same case for Romero too. 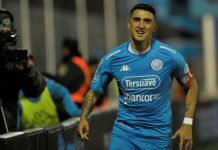 Stefano Callegari…player of the month in Argentine Primera….? He’s a substitute GK for Spurs but he did really well in that match so who knows….maybe he’ll get some playing time. He won’t be national team material soon….he is a third choice goalkeeper for spurs and his physique is not made for goalkeeping. Armani again obviously. Andrada would have really helped Boca a lot. These 2 r the best out in League. Andrada will probably be out for around 4 months, Gud for Rulli. It’s frustrating to see Rulli making errors. He is our hope of carrying the Goalkeeping baton for long time. Not playing (like Romero) is one thing but making errors is another. Anyhow hope Rulli gets better, And hope Andrada returns soon. He may be our next GK after Armani. Andrada vs Rulli. They were good goals..Boca was good in set pieces..ofcourse they were not lucky..not taking credit from River..River midfield and goal keeping is awesome..
the amount of Left attack options we have is really impressive – lanzini,pity Martinez, cervi , ocampos , DePaul, acuna. Suited position three man midfielder. while i agree lanzini is a classic no 10, if u look at last season in west ham , lanzini has played more in the left wing in a 1-2-3-4 formation & found lot of success. Especially once payet left. i wouldn’t place him as a midfielder in a 3-3-4 . He should play more higher & not deeper. the 3 man midfield ( in a 3-3-4 ) , i think gets locked with Palacios – Battaglia ( Ascacibar) – Lo Celso . With Dimaria out ( who used to own the left attack in 3-3-4) & Messi hiatus – it will be interesting to see who fills in the left & right attack in a 3-3-4 . Pavon and Angel Correa may have to fight for 1 spot I think for the Right side. A.Correa, Lamela and Pavon all play on the right side of the attack, also Ocampos and Lanzini can play there if need be. 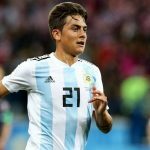 I think will be either a left playmaker(Lanzini, Pity) plus a right winger(Angel Correa, Rigoni, Pavon) or a right playmaker(Dybala, Lamela) plus left winger(Cervi, Angel and Joaquin Correa, Pavon). Lanzini probably the most versatile midfielder in the NT, can play left/right playmaker in a 3 men attack, CM in a 3 men midfield , number 10 behind a striker and even false 9. West Ham is less than average without him hope to see him back soon. I always believe that with him and Lo Celso in the starting 11, the outcome of our WC would have been different. Montiel, Palacios and Armani played well. Montiel should get call up for the NT.